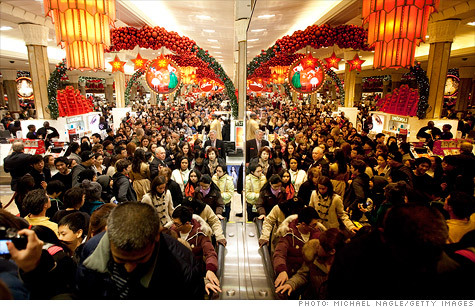 Black Friday Sales Hits Record, Retail traffic and Foot-falls up. Preliminary reports for Black Friday indicate that retailers may have seen their strongest sales ever during the all-important kick-off to the holiday shopping season. Retail sales on Black Friday climbed 6.6% this year to an estimated $11.4 billion, according to ShopperTrak, which tracks foot traffic at malls and stores. Last year, sales climbed just 0.3% to $10.7 billion, which was a record one-day sales amount at the time, according to the company. “Retailers continue to stretch out Black Friday weekend by enticing shoppers with doorbuster deals weeks in advance,” said Martin. Online sales were up 39.3% on Thanksgiving Day and 24.3% on Black Friday compared to the same days last year, according to IBM’s (IBM,Fortune 500) Coremetrics, which tracks real-time data from 500 retailers in the apparel, department store, health and beauty and home goods categories. “This year marked Thanksgiving’s emergence as the first big spending day of the 2011 holiday season with a record number of consumers shifting their focus from turkey to tablets and the search for the best deals,” said John Squire, chief strategy officer at IBM’s Smarter Commerce division. Consumers also spent slightly more than they did last year, although they spent most of that money on themselves. According to NPD Group consumers spent about 3% more on purchases during Black Friday. However, about 44% were self purchases up from 33% last year, the research group said. Total US visits to the top 500 Retail websites increased 2% on Black Friday as compared to 2010 and received more than 173 million US visits. Traffic has increased each day leading up to the Thanksgiving holiday and the total visits dipped slightly (-1%) on Black Friday compared Thanksgiving Day 2011. Early Black Friday sales resulted in a shift of online traffic, which climbed prior to the Thanksgiving holiday, however, continued heavy promotional activity helped to drive significant online traffic on both Thanksgiving and Black Friday. While Black Friday has been the top day for online retail traffic over the past two years, warm weather and early store openings encouraged shoppers to go online sooner this season. Among the categories driving the growth in traffic on Black Friday were Department Stores (e.g. Amazon and Wal-Mart) Apparel & Accessories, Appliances & Electronics (e.g. Best Buy) and Video & Games (e.g. Game Stop). Many of the major retail websites experienced growth on Black Friday, including Amazon, Best Buy, JC Penney, Sears and Kohl’s. Amazon.com was the most visited website on Black Friday for the 7th year in a row. IN A move that could pave the way for new investors to step in, Pantaloon Retail will spin off two of its biggest revenue grossers — Big Bazaar and Food Bazaar — into a new entity, Future Value Retail. The two formats constitute over 55% of the turnover of the country’s biggest retailer. Food Bazaar president Sadashiv Nayak has taken charge of both Big Bazaar and Food Bazaar while Rajan Malhotra, president of Big Bazaar, has moved to the Future Group as president, retail strategy. When contacted, Future Group CEO Kishore Biyani said: “We have been evaluating the option of creating a new entity for our value retailing businesses.” Last year, Pantaloon Retail had secured board approvals for hiving off the businesses into independent subsidiaries that could be listed at a later date. Under the proposal, Pantaloon Retail will be a holding company. Pantaloon officials familiar with the development said the group is examining a structure that would eventually enable it to strike a JV with a global retailer. Pantaloon Retail has been in talks with Carrefour, the world’s second-largest French supermarket group, for a JV in India. Under the scheme of things, Future Value Retail would serve as a major supply-chain entity for all Future Group store formats and help the company prune costs, a group official said. Technically, the sourcing and back-end of the store formats would be one while the front ends would continue to operate as separate entities. Currently, all Food Bazaar outlets, comprising its food and grocery supermarket business, are located within Big Bazaar formats. While Big Bazaar is the group’s hypermarket business and has 109 stores, Food Bazaar is a supermarket chain that has 152 stores with most of them housed adjacent to Big Bazaar. Food Bazaar’s business model resembles the value model of global retailer Wal-Mart. According to Nielsen data, Food Bazaar’s share in the FMCG space in terms of modern trade is about 28%. Pantaloon Retail is estimated to report sales of Rs 10,000 crore for 2008-09 while the combined revenues of Big Bazaar and Food Bazaar are estimated to touch Rs 5,000 crore. A proposed joint venture with a foreign retailer would enable the Future Group access sizeable dollar funds needed to expand its business. A foreign partner will also help the group bring in more efficiency in sourcing and logistics, helping it drive down prices and boost margins. Besides Big Bazaar, the Future Group runs Food Bazaar, KB’s Fair Price shops, Pantaloons, Central, Home Town, eZone and Aadhaar. The Pantaloon Retail stock closed at Rs 130.15, up 5.46%, on the BSE on Monday. In a challenging consumer environment, bargain hunters are flocking to modern value-retail formats like Big Bazaar, Food Bazaar, D’Mart and More, which have been coming up with discount offers to attract customers. This reflects a global trend, wherein value-retail formats are growing despite the overall slowdown in the economy. Last month, US-based Wal-Mart reported a strong 5.1% increase in same-store sales (excluding gasoline sales) in the US, even though lifestyle chains, like Target, Macy’s and Abercrombie & Fitch, suffered a drop in sales.